Unfortunately I can’t share what I got them in case they’re reading this 😉 but I can share some of the new bits dad and I treated ourselves to. Our first stop was breakfast in La Scala where I had a croissant, dad had a giant traditional pasty and we both indulged in a piece of shortbread each. It was great, especially the shortbread which was delicious. With our bellies filled we headed to TK Maxx and picked up a couple of DC cuddly toys for more than half the retail price! Bargain! Dad may go back and buy some more at a later date. Next up was HMV which sells music and accessories such as speakers, games and consoles and films (both blu ray and dvd). This particular branch has an extensive sci-fi and horror section. We came out with a few dvds, couple of CDs and a couple of books. 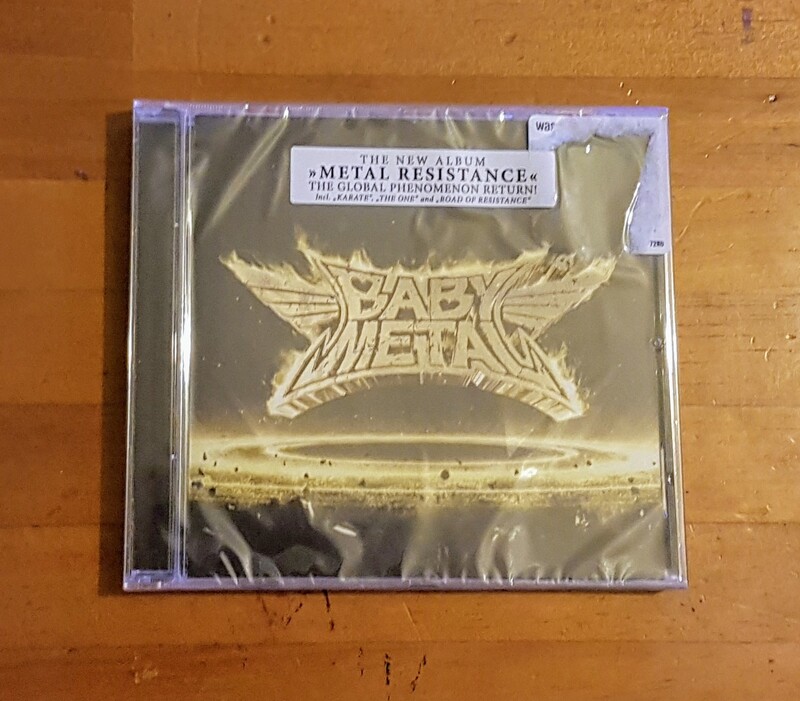 The CDs were by the Japanese metal band ‘Baby Metal’ who dad had recently started listening to and watching on YouTube. Their live shows are very unique but I’ve not heard enough of their music yet to make my mind up about them. Dad loves them though and hoped to see them live. The book I got was on sale for £4.99 with any other purchase and retails at £12.99, you can always count on HMV for impulse bargains at the tills. 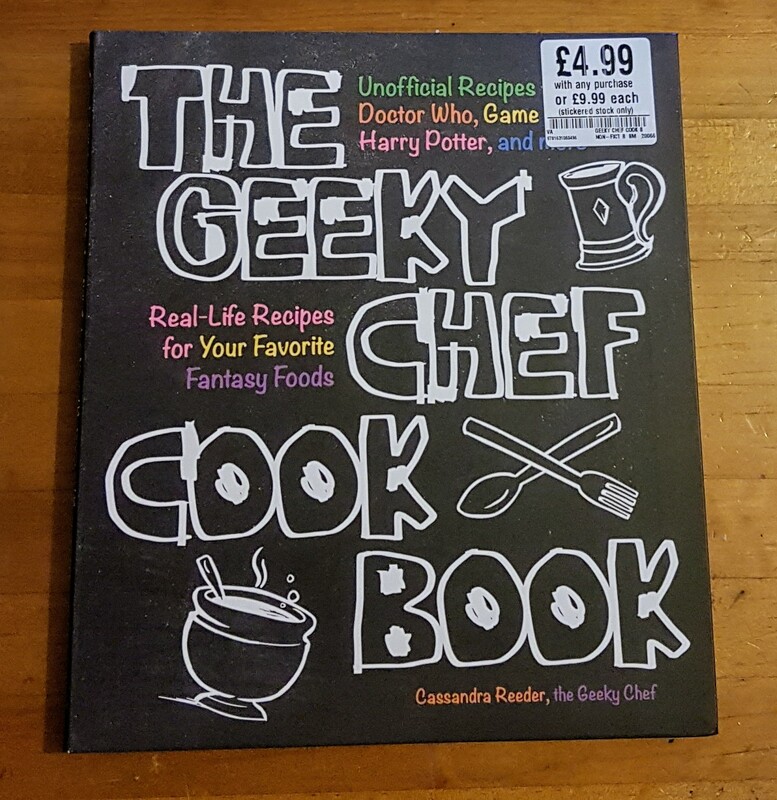 It’s called ‘The Geeky Chef Cook Book’ and has a wide range of food and drink recipes including Mudder’s Milk from Firefly and Gach from Star Trek. 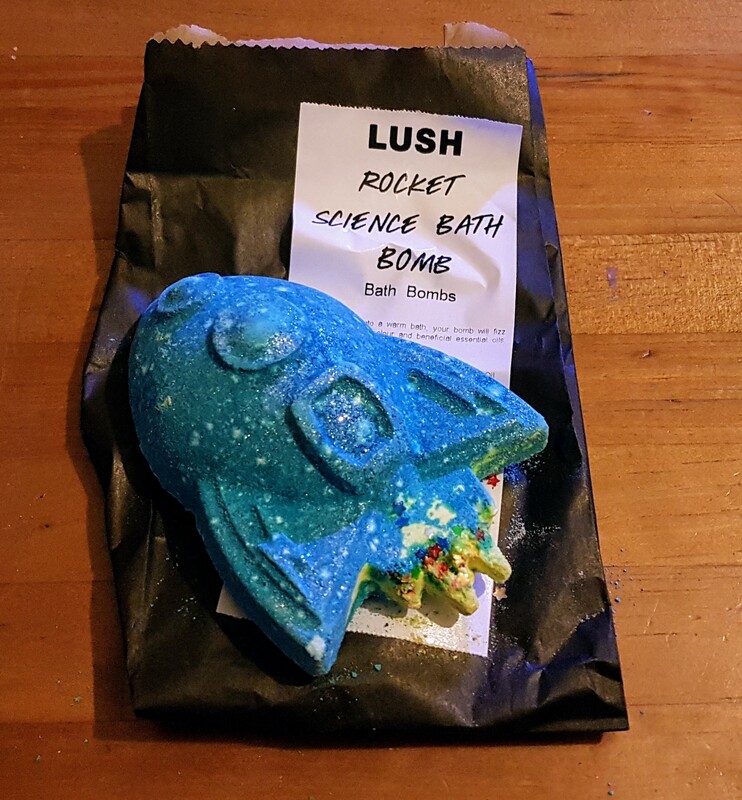 I bought another Twilight bath bomb as I’d run out 🙁 and one shaped like a rocket ship (called Rocket Science) which I’m told only arrived in store Friday! 😀 I haven’t tried it out yet but am looking forward too. It’s blue and yellow with glitter, sequin stars and is scented with bergamot and lemon. 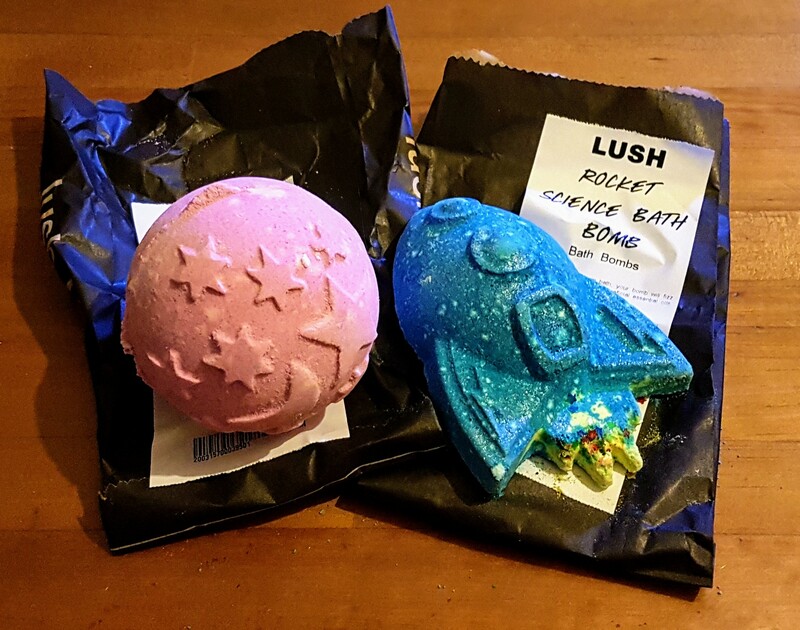 Speaking of Twilight, which is my favourite Lush bath bomb by the way, it’s now available in a spray which you can either spritz on yourself as a perfume or use as a room or pillow spray. The young lady in Lush spritzed some on my arm and it smells amazing (and lasted all day), I’ll definitely be picking up a bottle when my current room spray (a lavender one by Avon) runs out. We headed up the highstreet to Primark just as it started drizzling and by the time we had finished looking around and got outside it was hammering down. 🌧 We’ve had some strange weather recently! It’s been warm and humid, even in the rain, or hot and sunny… we’re more used to cold and rainy. We sheltered in Primark’s doorway for a bit with many others while the rain died down then made a quick dash to Lakeland. My favourite cookshop. 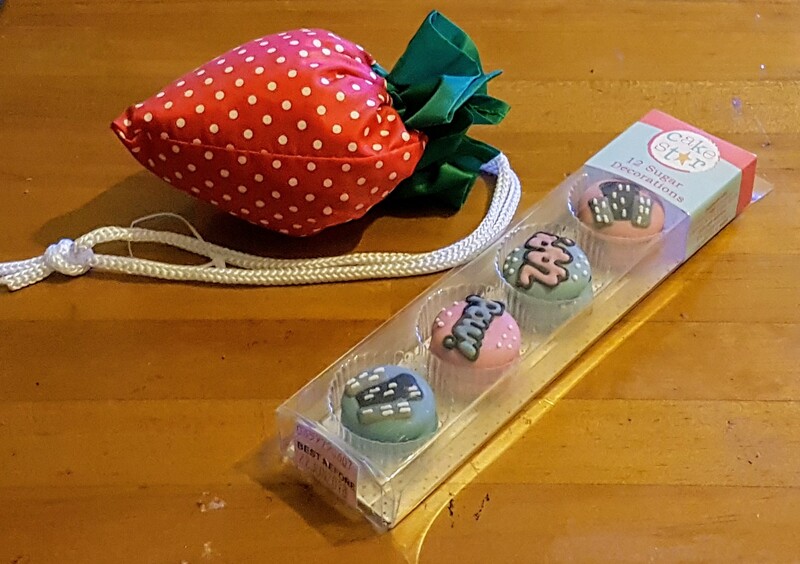 I bought some superhero-esque cupcake toppers and a strawberry bag as mine had split (I’ve talked about it before in my ‘What’s in my bag’ post). I’ve never gone in there and not come out with something! Lol. Our last stop was bookstore Waterstones to see if they had any hardback copies of Lord of the Rings and to see if the latest House of Night book was in stock. Nope, on both accounts. I’ve been looking for a new set of the Lord of the Rings trilogy after mine suffered water damage, long story short they were in my car when we were moving flats and my bottle of screen wash leaked on them. 🙁 I haven’t found a set I love to replace them with yet. It started hammering it down again as we reached the car park and didn’t stop the rest of the day. Nevertheless we had a good morning and it was nice to catch up with him. I love Baby Metal! I know some people find them really cheesy, but their music is so addictive. I almost booked tickets to see them live a few years ago, but didn’t have the money unfortunately. I’d definitely recommended listening to more songs though! Oh wow, that cookbook looks amazing. I’m definitely going to have to look for it at my local HMV. Though I’m terrible at cooking so it’ll be a real challenge. Love your strawberry bag! Primark has some great things now. When I used to work there they didn’t have nearly as much stuff, but now it’s amazing. So many cute things! Glad you and your dad had fun! And happy birthday to your mum! don’t you just love a bit of english rain?! haha it certainly adds a sporting element to a shopping trip when dodging in and out of shops to avoid looking like a drowned rat haha! What a haul! Of cute things nonetheless! This whole concept of having a day out with your dad sounds so nice and cute. I don’t think I’ve ever had a day out with my dad just doing stuff. I wish I had that kind of relationship with my dad, but with him being a workaholic, we never developed it… I hope your mother enjoys her gift!!! 🙂 And Oh no Baby Metal! Actually, I feel like the only real “Metal” part is how they dress and the background music… Their singing itself doesn’t seem so metal. XD They’re so cute and little, too… LOL. BABY metal is just awesome! Kawaii metal!